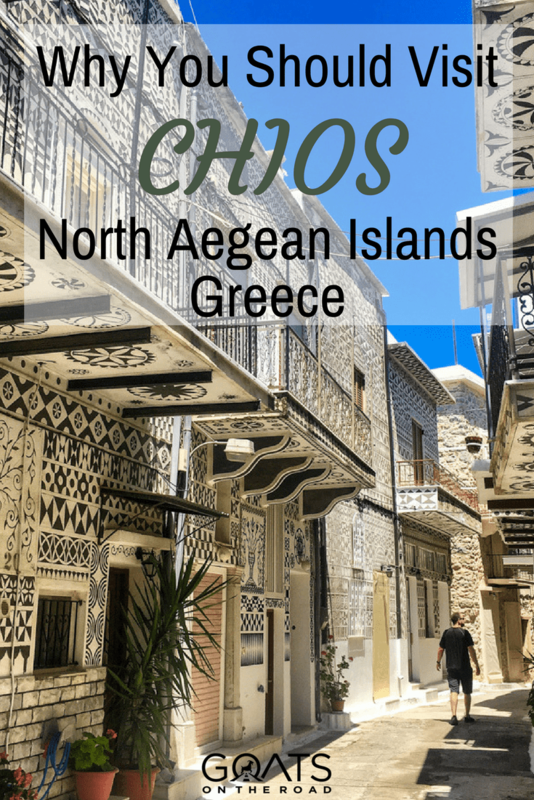 Chios Greece is quite possibly the most fascinating island we’ve been to, certainly in Greece. 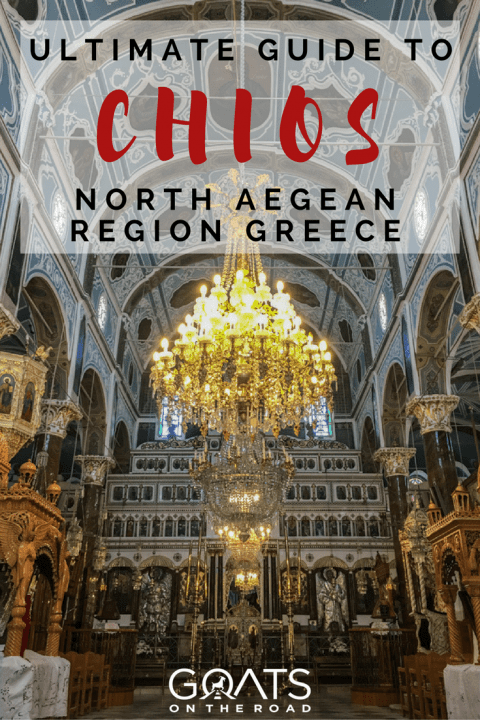 We’ve all heard of the popular tourist spots of Crete, Santorini, Mykonos and Corfu, but what about Chios? 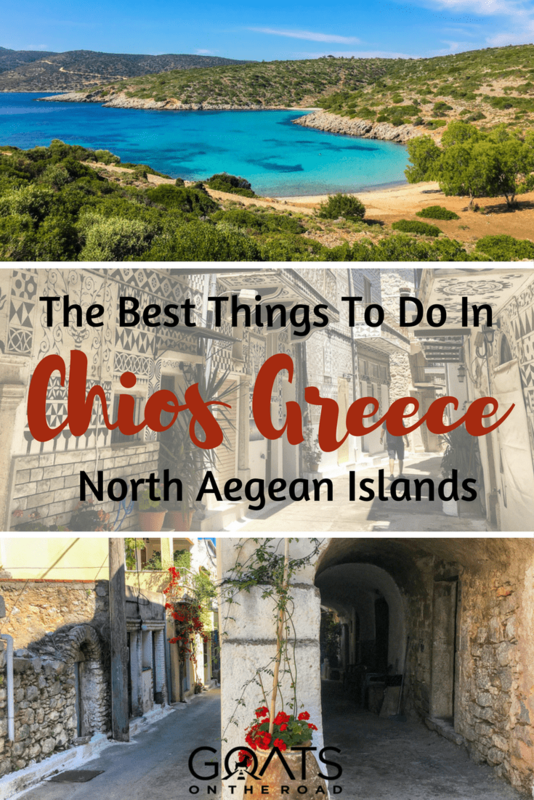 With medieval villages, a unique culture, welcoming locals, exquisite beaches (one of the best beaches in Greece that we saw) and traditional food and products, what’s not to love?! Isn’t this what we as travellers are seeking when we set off to see the world? The island that everyone had seemed to have forgotten about was ours to explore for four days, and the minute we arrived, we knew we could have stayed much longer. With some negative news stories being spread both locally and internationally, we were determined to uncover the truth about this magical Mastic island. You’ve probably heard about the Refugee Crisis in Europe? Chios Greece is located just 7 kilometers from Turkey, making this island a popular stepping stone for those fleeing war-torn countries in hopes of finding a better future in Europe for themselves and for their families. In the beginning, it was incredibly overwhelming for local authorities to deal with the influx of visitors arriving on the shores and no one was really sure how to deal with it. As you can imagine, the refugees were hungry and in need of shelter. Graciously, the residents of Chios Greece offered food, water, shelter and money to complete strangers! Recently, the government has provided the refugees with cash cards, which allows them to purchase food and any other goods they may need while they are stuck in limbo. No one knows whether these people will be sent back to their homeland, to Turkey, or further west into Europe. It’s heartbreaking to know that families are still living in tents and don’t have a home. To add to this heartbreak, is the fact that the news has made this situation sound dangerous, keeping tourists from visiting. 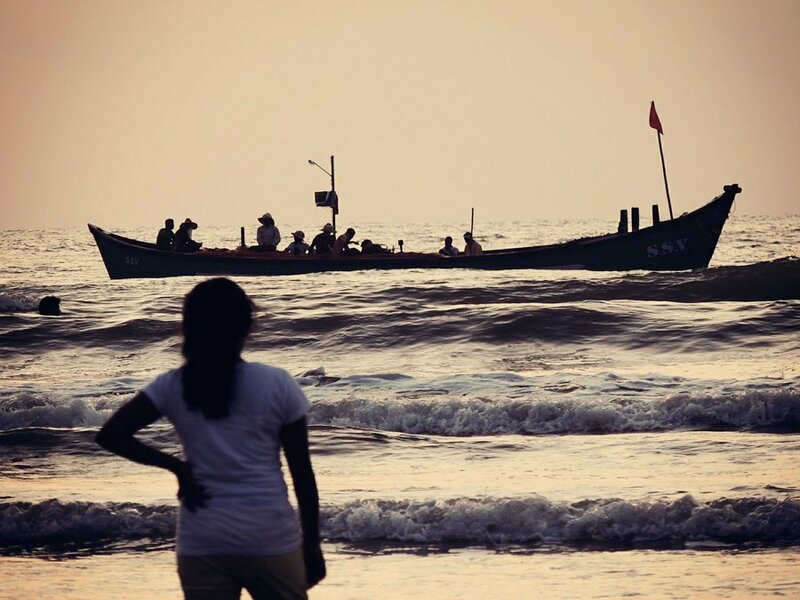 How having an encounter with a refugee is considered dangerous is beyond me. The refugee situation in Europe is a difficult one – the locals don’t know what to do with the foreigners and the refugees are stuck with nowhere to go. Everyone we spoke to on Chios Island was empathetic to the refugees and had a very optimistic view of the future for tourism on the island. In fact, there are more reservations for accommodation and tours this summer than in the previous year. The resilient attitude of the people living here, both local “Chiotes” and Greeks from other islands was astounding. 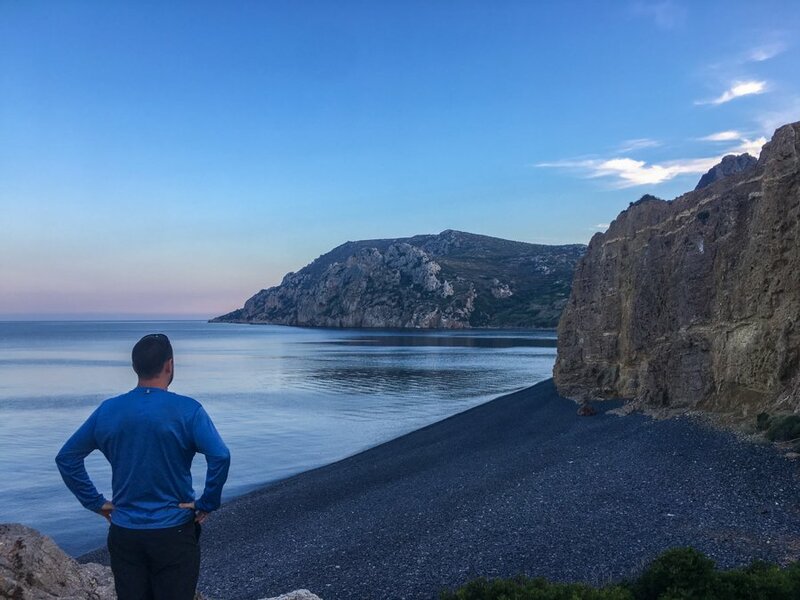 Based on our (very positive) firsthand experience, we believe the unique island of Chios is safe for tourists, and it would be a shame to miss this amazing destination based on displaced and disheartened people. Chios Island is a place you shouldn’t miss, and is by far one of the best places to visit in Greece. 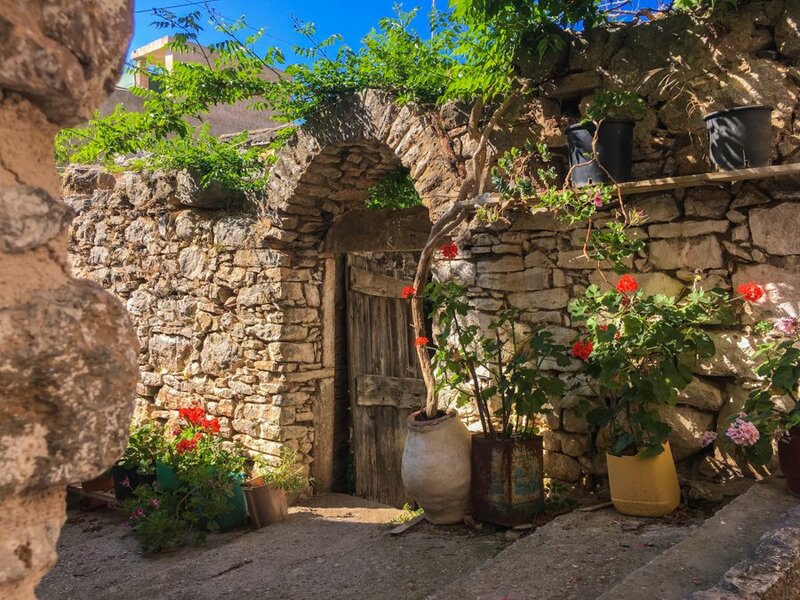 Hopping in our rental car, we made our way past the stunning stone buildings and walled area of Kampos, a village where the elite from the Genoese period (1304–1566) lived in mansions which still stand today. Immediately, we noticed the difference in architecture from Chios Greece compared to the Ionian Islands where we were travelling previously. The islands of Zakynthos, Kefalonia and Corfu were under Venetian Rule for much of their history, while Chios Island fell to the Byzantines, Genoese and Ottomans. Although Chios is the 5th largest island in Greece, because we were travelling in the off-season, we had the roads practically to ourselves. Making our way to the southeastern end of the island, we arrived at Emporios Bay, which would be our studio apartment for the next four nights. Our balcony overlooked the large shared pool and rolling green hills covered in shrubs. Balcony views at Emporios Bay Hotel! With no noise pollution other than that of chirping birds, this place was incredibly peaceful. The family-run apartment was comfortable, clean and in an excellent location. We were steps from the glass-calm sea and harbour, and a 5 minute walk brought us to the volcanic Mavra Volia beach, a large bay with black stones and perfectly clear water. A pathway leading from this bay brought us to the neighbouring Emporios Mavros Gialos beach. Our apartment was just a couple of minutes by foot from two of the nicest beaches on the island! With just a few days to explore Chios, we dropped off our bags and headed to the impressive Mastic Museum to meet with Roula from Masticulture to learn about the fascinating Mastiha (Mastic) culture of the island, something we had never heard of prior to visiting Chios Greece. 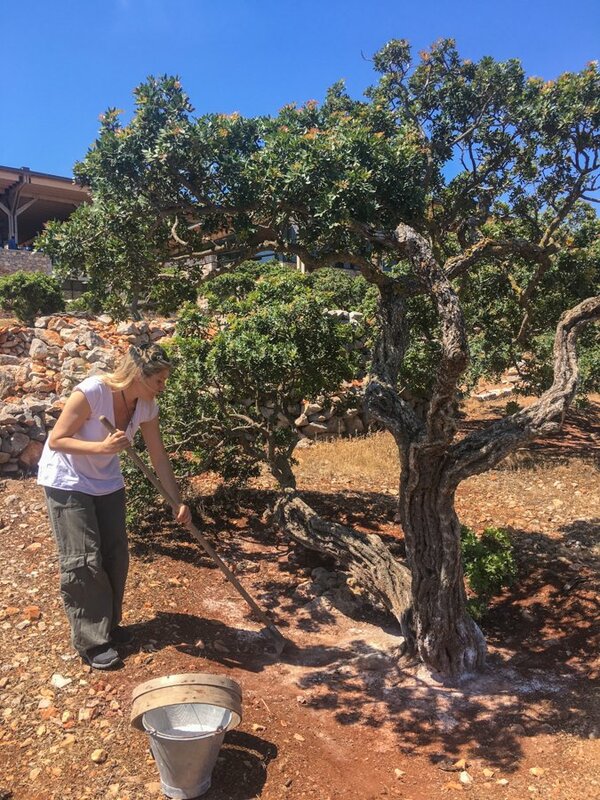 Mastic trees grow all over the world, but the sap that is so valuable is only produced by the trees on this particular island…and only those growing in the southern half of Chios Island! The resin, or “tears” as it’s commonly referred to, have been a part of Chios’ history for centuries. In fact, this tree was the reason for many foreign attempts at conquering Chios, which ultimately led to the fortification of many of the villages on the island. When the bark of the tree is slashed using a special tool, the sap trickles out and hardens. Once all of the resin is collected (including bits of bark, dirt, stones, leaves, etc.) the arduous process of sifting, storing, washing, drying and cleaning of the sap begins. All of this is done by women, by hand. Because cleaning resin is such a boring job, the women of Chios Island came up with the brilliant idea to make it more of a social get-together, complete with gossip and wine. As well as having a pine flavour and being a popular product for chewing gum, mastic has excellent heath benefits. It’s been proven to work as an anti-inflammatory and anti-bacterial product. Plus, mastic is a natural cure for stomach aches and ulcers. If you want whiter teeth or to prevent cavities, chew some mastic! This stuff is magic. Roula taught us all about mastic and how the culture, architecture and landscape of Chios has evolved around it. She even invited us out for some cocktails made with, you guessed it, mastic liquor. 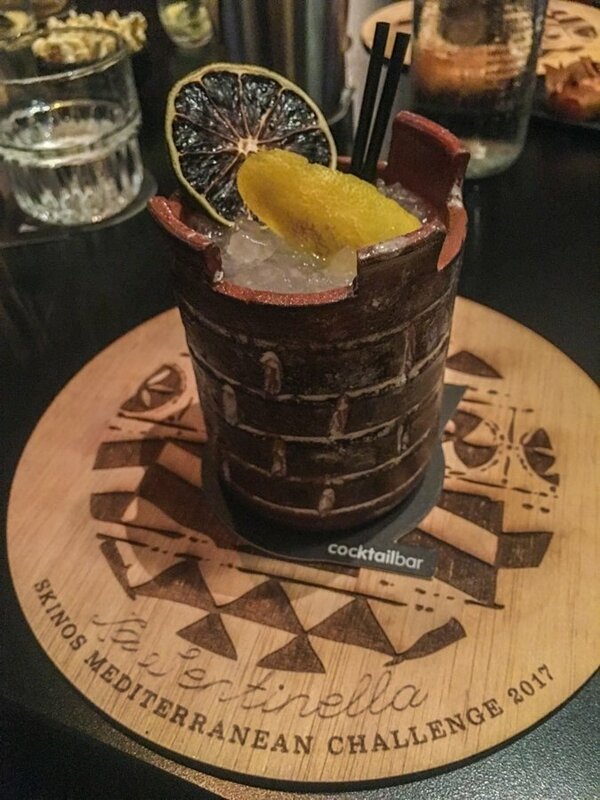 Oz cocktail bar is located in the town of Chios. Stepping off of the pedestrian-only street, we entered into a funky bar, complete with energetic staff and a “laboratory” for creating a drink to suit our tastes. Needless to say, it was a fun evening. After having a drink made with rum, and a drink made with mastic liquor, I can honestly say I preferred the local flavour. 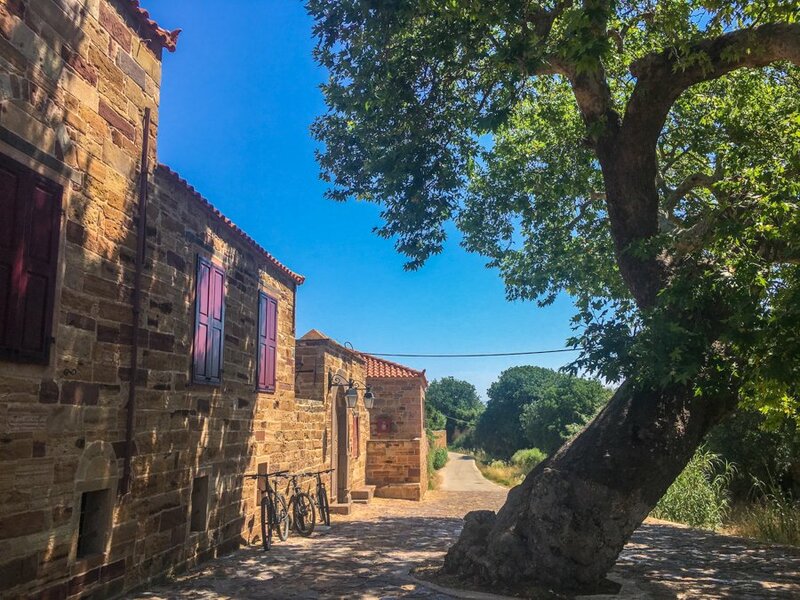 From the mastic museum and mastic liquor, we moved on to visit the Mastic Medieval Villages of Mesta, Pyrgi and Olympoi, which all derived from the production of mastic products (see, everything on this island revolves around the mastic tree!). Because the “tears” were so valuable and mainly used by the rich, fortified villages were built in the 14th century to protect this product from Arab pirates. Some villages had underground tunnels, and all of them had narrow, confusing alleyways with dead-ends. Locals lived on the second level of their homes, and their livestock lived on the bottom. Being raised up on the second level gave them a better vantage point over attackers, and an escape route to the neighbouring rooftops if needed. First up on our day of village exploration was Pyrgi with its white and black geometric “xysta” designs, which are carved into the buildings by hand. The lanes were so narrow that the neighbouring balconies practically touched each other above our heads. Bright bougainvillea plants climbed up the facade of the homes, reaching for the balcony on the second level. Stone tunnels provided some much-needed shade as we wandered through this pretty village. Friendly locals spoke to us in a language native to their village (each village has its own dialect), and we replied with English and smiles. We visited the Byzantine Agioi Apostolo church, which dates back to the 13th or 14th century, before moving on to visit two more Mastic villages in the area. 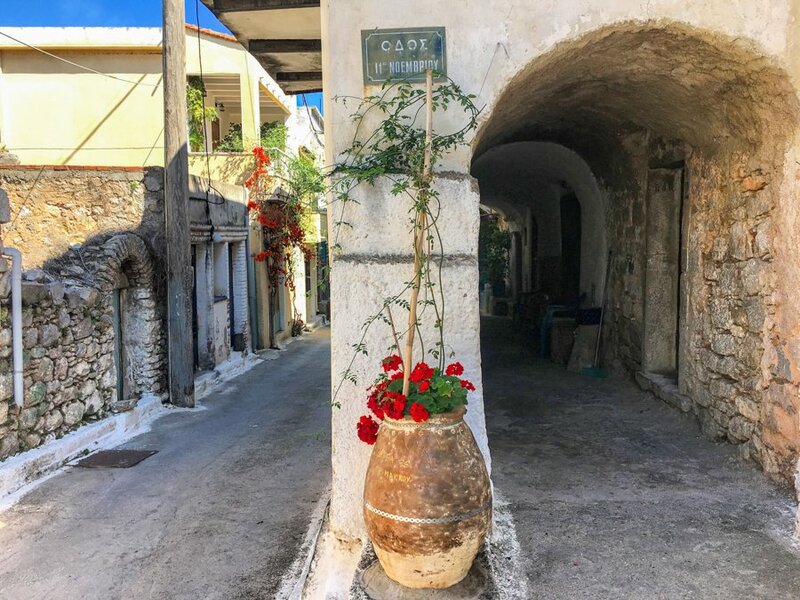 Mesta is probably the best preserved medieval village in Chios Greece, and the most popular for visitors as it has numerous accommodation options. Apart from a couple of Turkish tourists, we had the village to ourselves, and we loved it. One of the many joys of off-season travel for sure! As with Pyrgi, vines and flowers climbed up stone walls, while the towering Megalos Taksiarhis church dominated the center of the village. 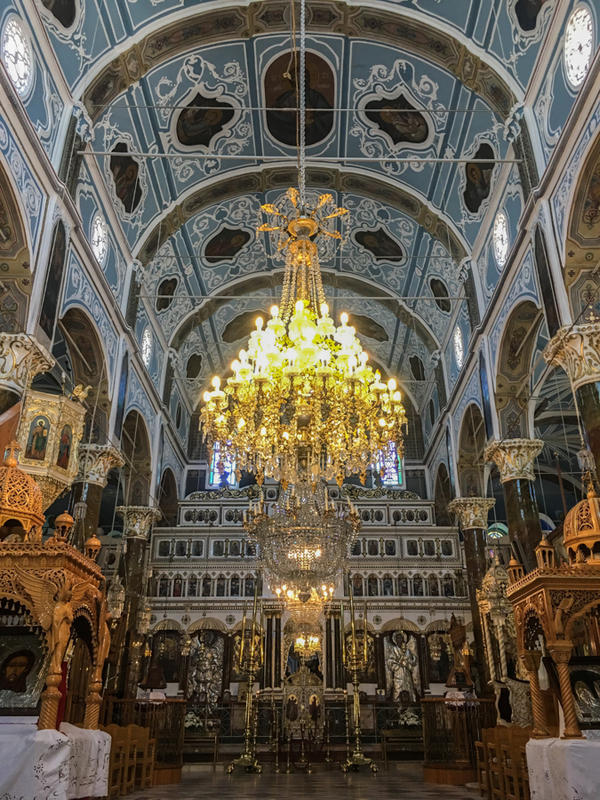 Entering the religious building, which was built in 1868, we couldn’t believe how ornate it was. Apart from someone who was sweeping the grounds, we were the only people in there. Finally, we made our way to Olympoi, a village with a fantastic restaurant, beautiful buildings and welcoming locals. The village had one entrance and all of the homes were attached, with the doors facing inwards, meaning if you were to look at Olympoi from the outside, you would only see what looks like a walled fortress. 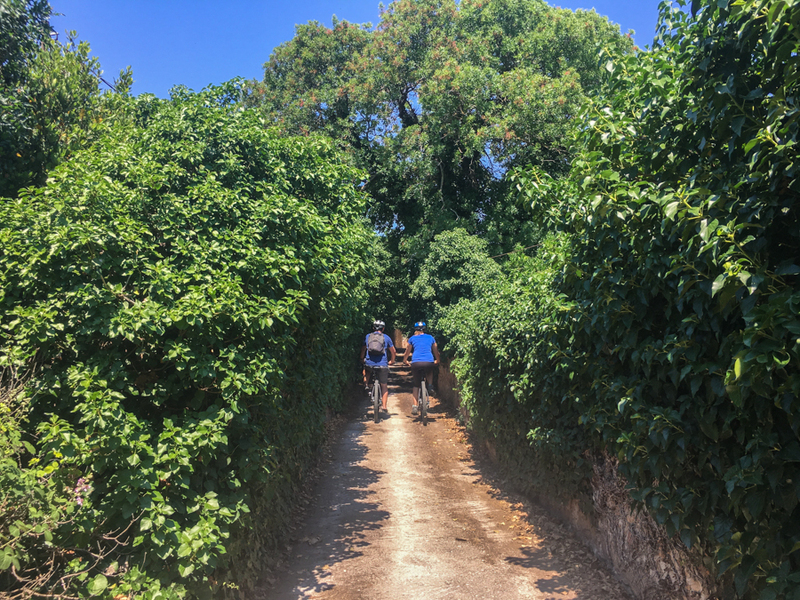 As if a trip to Mesta and Olympoi wasn’t interesting enough, we found out that there’s actually a pathway connecting the two villages! The hike takes about an hour and passes by ancient churches and stunning farmland. This is one of the eight marked walking routes available on Chios Island. Which street do you want to take? 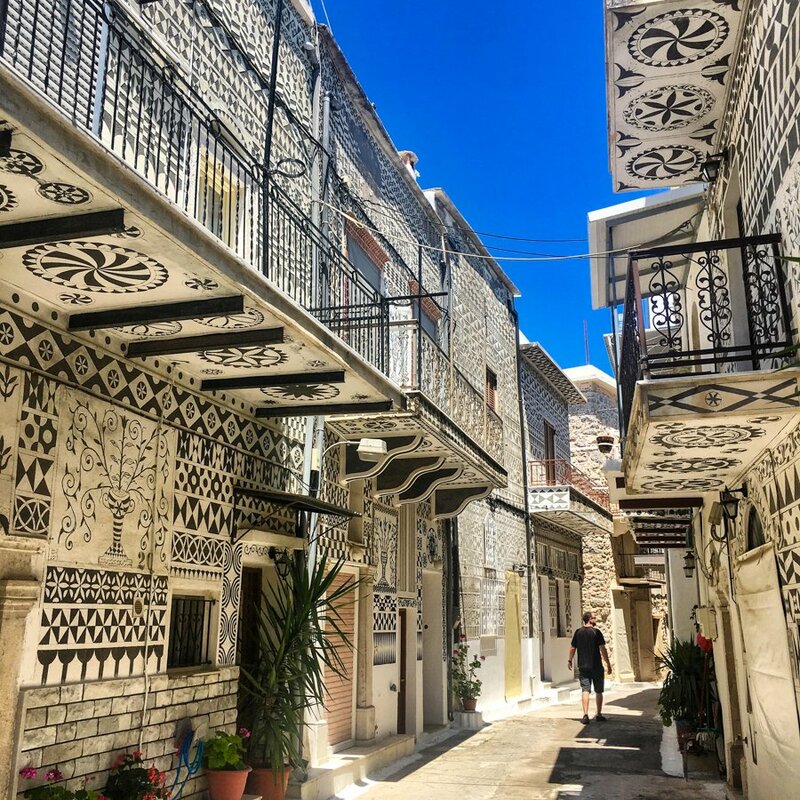 These three medieval villages were some of the most unusual places we’ve ever explored, but, Chios Greece would delight us with one more of its famous villages, Kampos. We drove past this stone complex when we first arrived on the island, but now it was time to get into the heart of it, on two wheels. Triandafyllia from Goat Trails (how perfect is that name?!) met up with us for our day of biking around the scenic area. 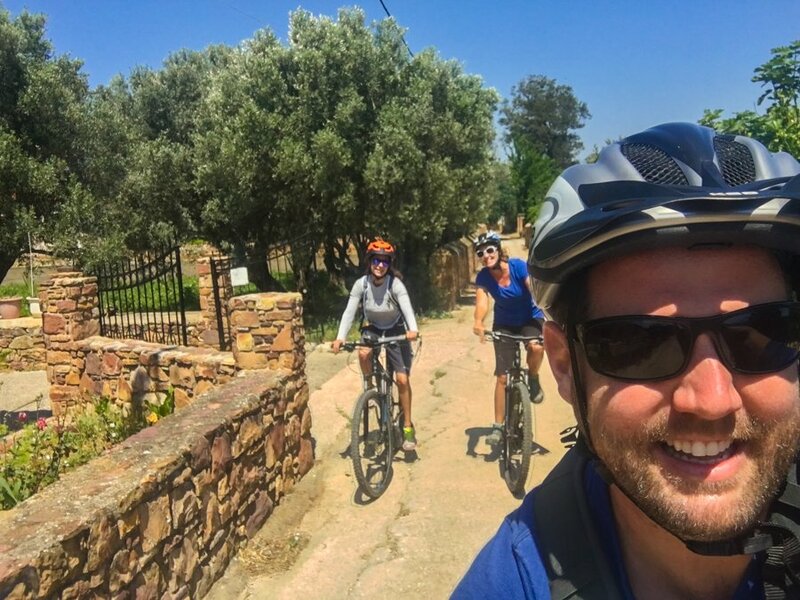 Heading off on our mountain bikes, we cycled through farmland, while zigging and zagging through orange groves. We explored narrow lanes lined with bushy trees and low stone walls. We passed by gorgeous mansions, and pretty plazas, while learning about the history of the area from our guide. Just as the sun was getting too hot to bear, the tour was finished and it was time to fill our bellies with food, and cool off with a local beer. Together with Triandafyllia, we made our way to Astrakia in Kampos, which was the setting of our afternoon cooking lesson. We hadn’t even tasted any food, or learned how to cook any traditional dishes, but we were already in awe of the perfect locale and the wonderful people who would be joining us. 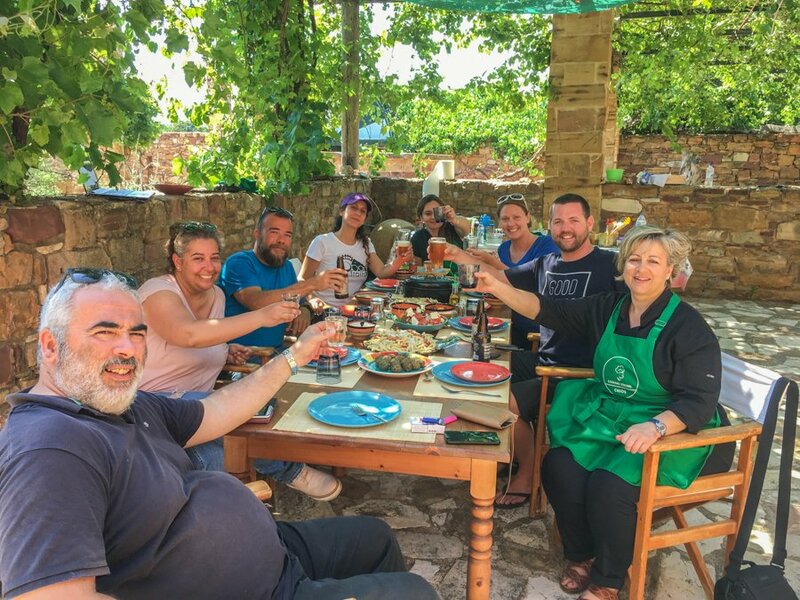 We would be spending the afternoon with Elias and his wife Joanna, (who are the owners of Chios Cooking Lessons), Triandafyllia and her boyfriend Pedro (from Goat Trails), Dora (the chef) and Maria (the translator for Dora). Some other friends of Elias and Joanna stopped by throughout the day to say hello, and the entire afternoon felt like we were just hanging out at a friend’s house, rather than being on a tour. 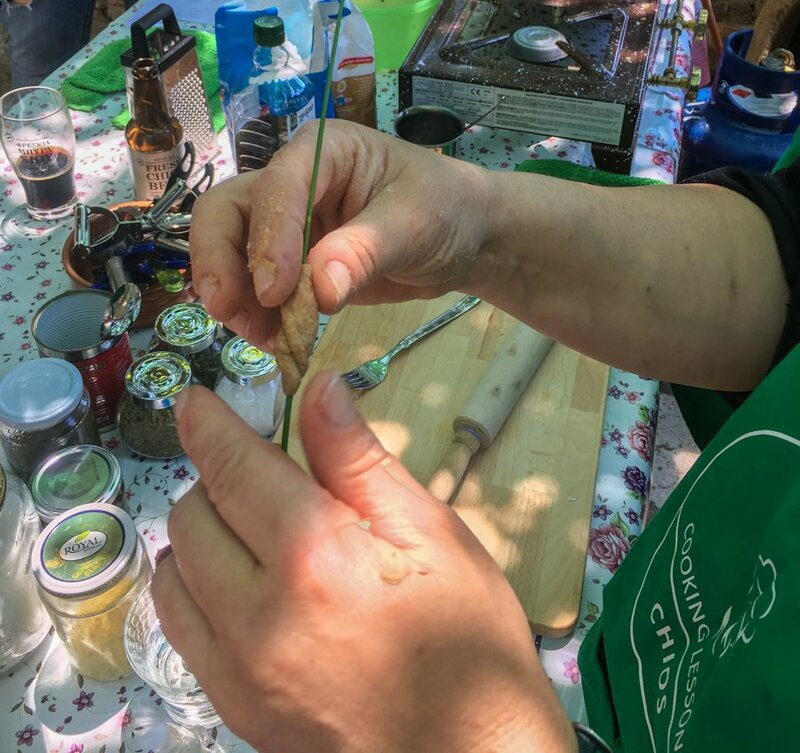 We learned about Chios Island cuisine from chef Dora, while watching her expertly roll pasta around the stem of a spartos plant to help form the shape, while keeping a hole in the middle of the dough. Elias and Triandafyllia explained about the traditional candy, alcohol and food products, made from mastic and aloe vera, all while sipping on the local Chios Beer, which is unfiltered and very tasty! All of the ingredients were locally sourced and the menu for the afternoon was prepared and made with love. 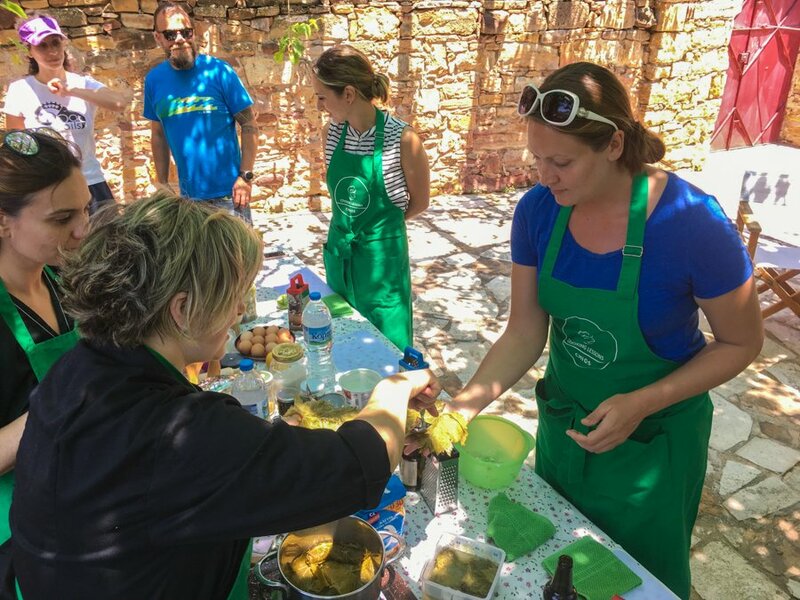 We helped with the cooking and were rewarded for our efforts with delicious yaprakia (stuffed vine leaves), Greek salad, traditional pasta with red sauce, zucchini balls and an omellete dish. 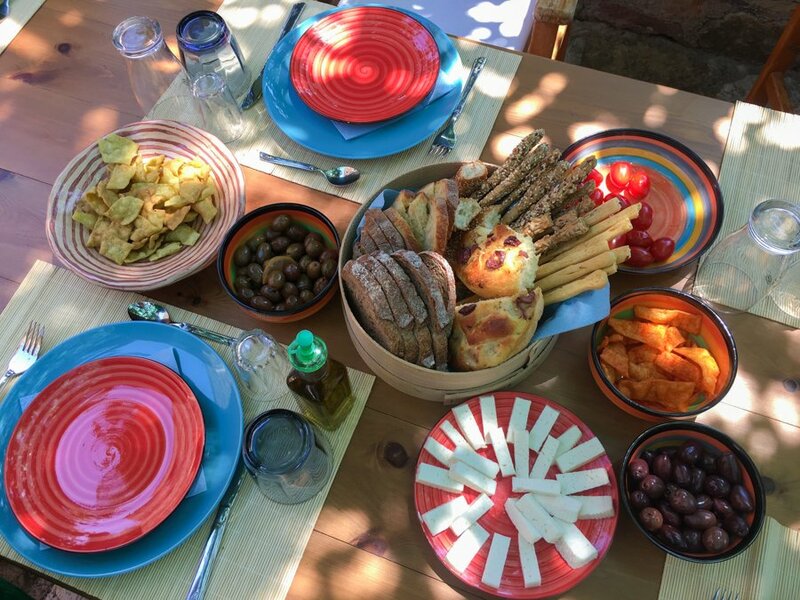 Interspersed between the dishes on the table were numerous appetizers – fresh bread, local white cheese, olives, fried bread and cherry tomatoes. Some delicious appetizers on the table – we were full even before the main courses! The setting and food were fantastic, but the company we found ourselves surrounded by and the conversations we had were the best part. We’ll never forget this afternoon with our new friends from Chios Greece. Love these people! Look at this setting for lunch, conversation and laughs! Chios Island is one of those travel destinations that will stay in our minds for years to come. 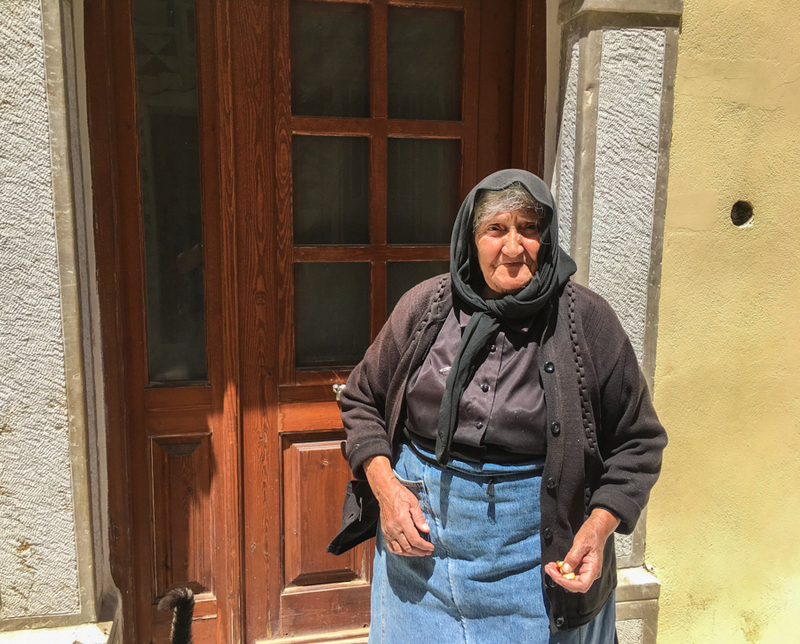 Not only were we amazed by the history and medieval villages, the mastic culture and the pristine beaches, but the people we met really made an impact on our trip. From the lovely Roula and Vasillis and the entire group from Chios Cooking Lessons and Goat Trails, to the wonderful family at Emporios Bay Hotel, and all of the owners of restaurants and bars that we spoke to, everyone had a story to tell, and everyone welcomed us with open arms. We’ll be back to Chios Greece, that’s for sure. Check out Aegean Airlines for flights to Chios Island. To leave Chios Greece and head to nearby Lesvos Island, you can go by ferry for around $30. Ask at your hotel or guesthouse to see if they can book it for you. Otherwise, you’ll have to purchase your ticket at the port. We suggest having a rental car. We rented ours with Hertz, using Expedia.com to find the best rental car rate. The further ahead you book, and the longer the duration, the cheaper the car will be. 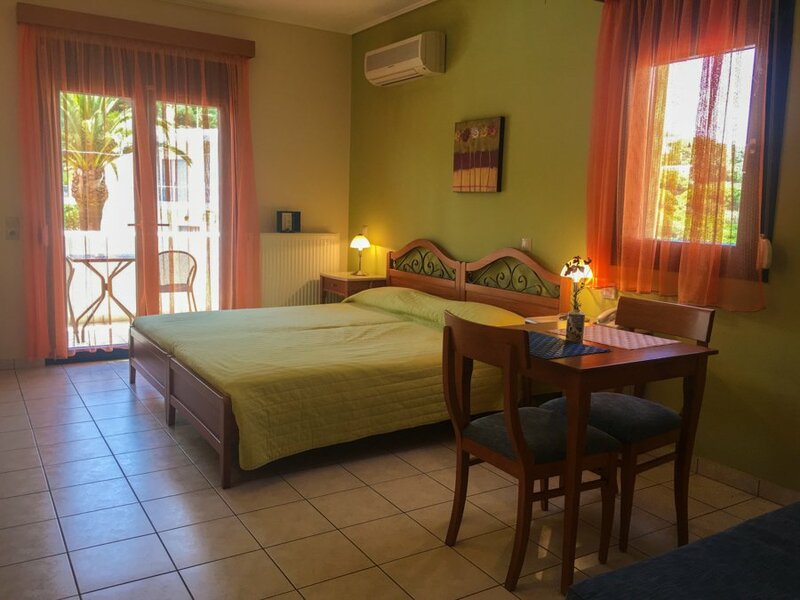 Emporios Bay Hotel is in a great location and our stay there was a very positive one. When we stayed, studio apartments were from €40 / night. 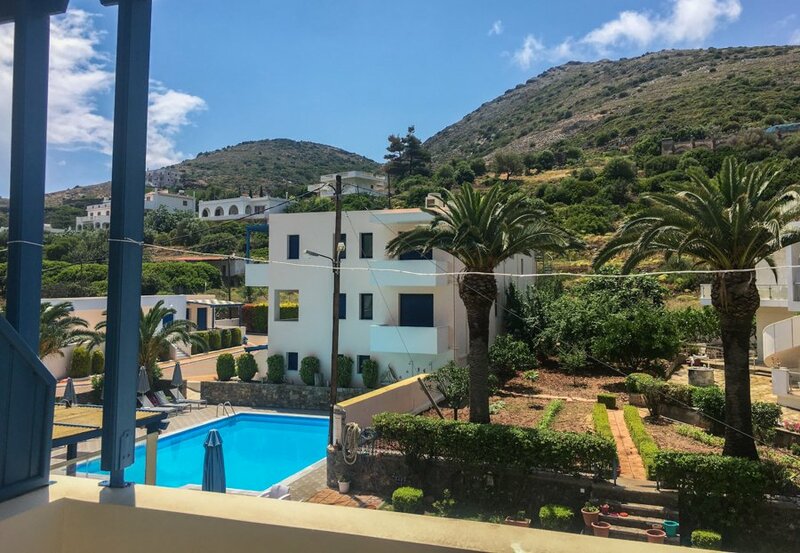 Click here to learn more about Emporios Bay. 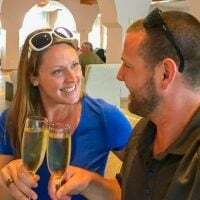 For hiking and biking around the island, contact the wonderful couple at Goat Trails. They speak English and are a lot of fun to be around. Seeing Chios by bike and / or foot is highly recommended. Click here to learn more about the tours on offer, and the costs. Check out Chios Cooking Lessons for a fun (and filling!) afternoon. The owners and chef are great, the traditional food is delicious, the setting of the lesson is stunning, and you’ll definitely get your money’s worth on this tour. Click here to learn more about what’s included in the tour, and the costs. Some of our favourite restaurants and bars around the island are: Oz Cocktail Bar, Lava Stones Taverna and Amethistos. 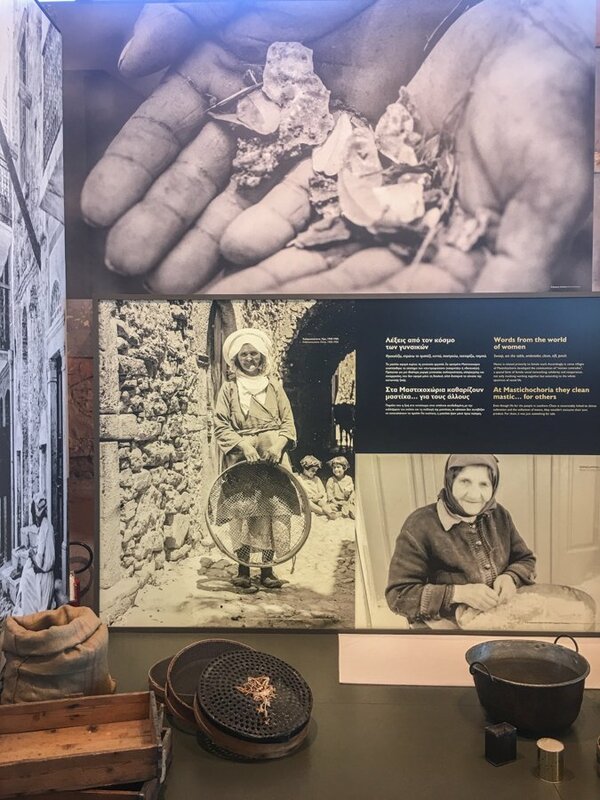 Even if you’re not into museums, we recommend checking out the new Mastic Museum which will really give you an idea of how important the mastic culture is on Chios Island. Entrance is €3. Based on the beaches we saw, the best one is Agia Dynami! There were 4 other people here when we visited. The cove is stunning. Bring water and food as there is nothing here. 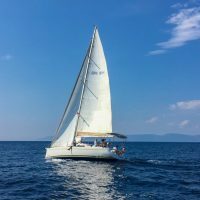 If you’re interested in enjoying an eco-friendly holiday in Chios Greece, speak to Roula and Vassilis at Masticulture.com. They have kayaks for rent, camping options available, agriculture classes, cultural classes, star-gazing experiences and more. A huge thank-you to Discover Greece for assisting with our flight, accommodation and tours during our trip to Chios Greece! The rest of Chios Island we planned, booked and paid for ourselves. All opinions and thoughts remain our own, despite any complimentary services received. How much Greek do you need yo know in order to get around here? I would like to know whether the roads in Chios are easy to drive on, meaning wide enough for cars moving on both directions at the same time etc, especially for someone who is used to driving on the opposite site (ie the English way). Also whether there is enough light to drive at night.